Ramadan Kareem to all those celebrating this special month. Ramadan is a time of reflection and reminds us to consider others, and that includes our close companions, animals. Animal welfare activists and lovers in general are rejoicing at the new Ramadan TV show, “Stories of Animals in the Quran,” which starts its daily broadcast on 1 August on Al-Hayat channel. Thirty half-hour episodes that depict the lives of animals mentioned in the holy book will be screened in an attempt to improve the treatment of animals, using religion as a powerful motivator. 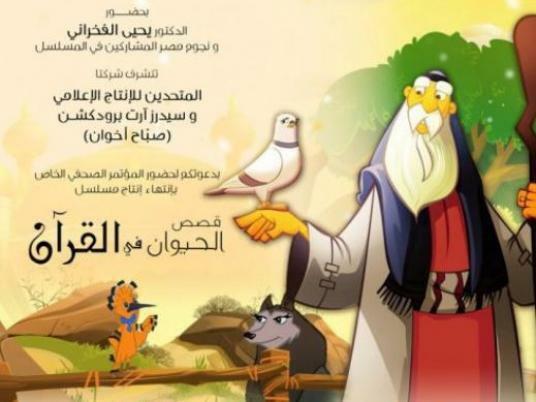 This topic is very different from the usual Ramadan TV shows, with their share of thwarted loves, terrible deceptions and complicated familial imbroglios, even before considering that it is a cartoon and famous Egyptian actors take on the voices of the various animal characters. “The release of this new TV show is fantastic news for us,” says Dina Zulfikar, a renowned animal welfare activist who is convinced of the success of this show. “One of Egypt’s most beloved actors, Yehia El-Fakharany, is narrating the stories, and this in itself ensures a broad audience in Egypt and in other Arab countries,” she explains. What do you know about Ramadan traditions? Did you know that one of the best known songs of Ramadan has its origins thousands of years ago? “Wahawy ya wahawy/Eyaha/We kaman wahawy/Eyaha” — these are the introductory lyrics of our most popular Ramadan jingle. My brother and I have been singing them since we were 3 years old. But, as in English, “wahawy” and “eyaha” seem to mean little in Arabic, at least until one knows the story behind the song. These lyrics, which songwriter Hussein Helmy al-Manesterly developed into a complete song that was composed and sung by Ahmed Abdel Kader and Ahmed Sherif, are actually inspired by a popular ancient Egyptian rhyme.